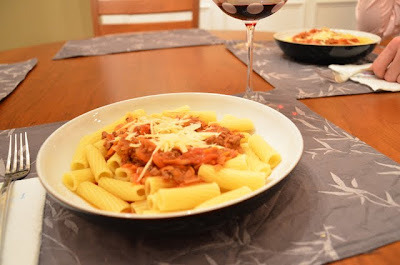 While I’m honestly still in search of my “favorite” bolognese, this was a pretty delicious attempt. For me, it was a little too chunky…I kind of like a smoother sauce with meat versus an overall chunkier one. Regardless, I wouldn’t mind eating this again! Heat oil in a large Dutch oven or skillet over medium heat. Add grated carrots and onions and cook for a few minutes. Make a well in the center of the mixture and then add in the ground beef to well. Cook for a few minutes until brown, gradually stirring it into the carrot mixture. Add oregano and basil. Once the meat is browned and combined with other ingredients, make another well. Add tomato paste and let it heat up. Add garlic and stir to combine. Make a well in the center of the mixture and add red wine. Stir together. Add Worcestershire and canned tomatoes and stir. Add milk, stir, and let simmer for 30 minutes to 2 hours. Serve over pasta with Parmesan.